Notwithstanding the fact that the taste for food is one's subjective opinion and different people can have different views about what constitutes a delicious and healthy food, yet there are some cuisine that enjoy worldwide recognizition and appreciation. Keralese cuisine is one of them. 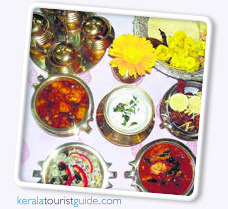 The cuisine of Kerala is what you describe as extremely exotic and relishing. Kerala has been influenced by many culinary methods in past but when you visit the state itself, you will realize how deeply rooted is traditional Keralese cuisine in the lives of people. Cooking in Kerala is more than just preparation of food. It is a celebration of the rich culture that is deeply imbued in the life of Keralese. Kerala is known for its traditional sadhyas, a vegetarian meal served with boiled rice and a host of side-dishes. The sadhya is complemented by payasam, a sweet milk dessert native to Kerala. The sadhya is, as per custom, served on a banana leaf. The southern Kerala dishes are often spiced with garlic, whereas in North Kerala garlic is generrally avoided in all vegetarian dishes. Traditional dishes include sambar, aviyal, kaalan, theeyal, thoran, injipully, pulisherry, appam , kappa (tapioca), puttu (steam cake), and puzhukku. Coconut and Coconut Oil is an essential ingredient in most of the food items and is liberally used. Keralese make use of quiet a few basic ingredients constantly while preparing their food. These include rice and coconut. The number of ways in which these two items are used in the Keralese dishes is hard to even imagine. Infact, for a person visiting for the first time, it might just seem that these two are all that is used to make Keralese dishes. Nevertheless, the perception, a gourmet will definitely delve deep into what other items make these dishes so tasty. Spices is for one. And here spices do not necessarily mean chillies (isn't this what is often implied by the term?). Spices in Kerala, or rather whole of India mean much more - a rich use of cinnamon, cardamom, ginger, cloves garlic, cumin, coriander and turmeric. Extensive use of curry leaves and mustard seeds add distinct taste to Keralese food. For their breakfast, Keralese normally have Appam, Kootu Dosa, Masala Dosa, Pathiri, Palappam and Rava Idly. Dosa and idly are not strictly Keralese dishes as they have made their way into the state from the neighbouring state of Tamil Nadu. However, Puttu, which is one of the favourites, is an original Keralese breakfast dish. It is prepared from the dough of rice flour which is layered with grated coconuts and then steamed in a hollow bamboo cylinder. To add more taste to puttu, it is sprinkled with sugar and mashed bananas..
Other indigenous food items of Kerala include Thorans, Avial, Olen, Pachadi, Sambar, Stew and Appams. The first on of these thoran is a dry dish wherein chopped par -boiled vegetables, meats and seafood are flavoured with mustard seeds. Avial is a mixed vegetable dish with gravy of yoghurt and coconut. Olen is prepared with the help of ash gourd and dry beans. Coconut milk's taste is instantly recognizable in Olen. Pachadi is a thick sauce made from ingredients like sugar, yoghurt, grated coconut, mustard seed and spices like green and red chillies. Sambar can be counted as a bit of broth and sauce. Its main ingredients are mashed lentils, cooked vegetables and spices. For people in the habit of eating mildly flavoured food, sambar can be pretty too hot. Appam, particularly Kallappams and Vellappams are a huge favourites too. Kallappam is a sort of pancake while Vellappam is crepe like lacy edged item. Bananas are, apart from rice and coconut, used quiet a lot in Keralese cuisine. They are made into rounds fried chips or fried and dipped in jaggery to prepare sweet. Moreover, they can also be used to make Kaalan, a subsidiary dish during meal. Yoghurt, chilly, turmeric cumin seed and curry leaves are used to make Kaalan. A true feast of Keralese items can be enjoyed at the time of sadya, traditional big feast. Till very recent times, weddings in Kerala were considered grand only if the sadya was grand. The manner in which food is to be served in sadya is also important apart from the dishes that are offered. An improperly laid sadya is indicative of bad or unsophisticated manners. The food is served on a plantain leaf (set in a fixed direction) and that also in a typical manner. is the elaborate dish, which is a totally extravagant affair. Avial, an all time favourite, is a happy blend of vegetables, coconut paste and green chillies. Avial's seasoning is a spoonful of fresh coconut oil and a sprinkling of raw curry leaves, stirred in immediately after the dish is taken off the stove. 'Kottucurry' is made out of cubed potatoes, onions and green chillies cooked in coconut milk with plenty of red chilli. 'Olan', a bland dish of pumpkin and red grams is prepared by cooking it in thin gravy of coconut milk.